I know I'm being pretty optimistic when I say fall is in the air. It's still close to 100 where I live, but we had our first "cold front" of the year--the low was in the 60's!!! That got me thinking about fall. I don't go crazy decorating for holidays (remind me I said that when Christmas rolls around...), but I do like to make a few seasonal changes to spruce things up a bit. 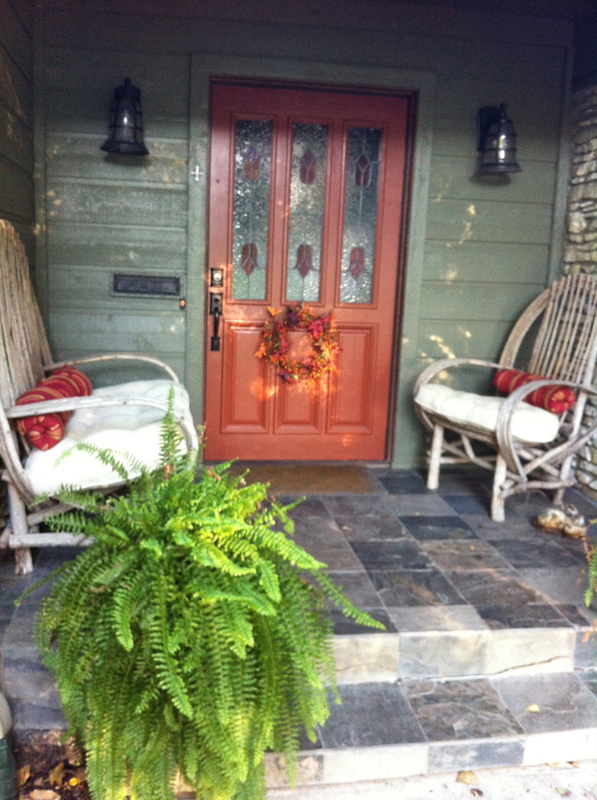 Really simple stuff like a new wreath on the door and different cushions outside. It's easy to bring the seasons inside too. A quick trip to the store to buy gourds and candy corn and I'm ready to go. 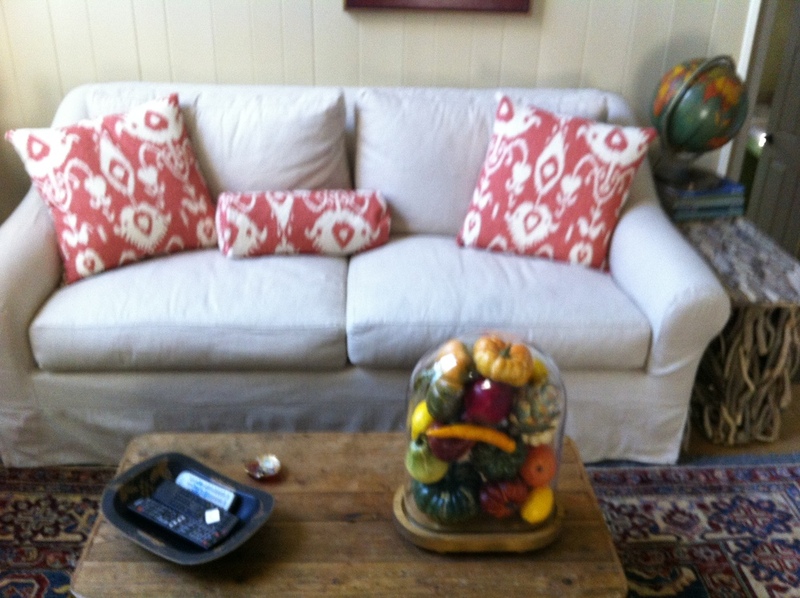 First, I filled a glass dome I have with gourds for a table in the den. That's all that room needs for now. A new centerpiece on the dining room table and some grapevine for the chandelier and the room feels ready for fall. Another favorite trick is to swap out pillows on sofas and chairs. What I have learned to do over the years is to buy some really nice pillow forms in the sizes I need, then make interchangeable covers for them. It makes storage easy since you just fold the covers and put them away, and I can switch them out whenever I want a new look. I changed the floral pillows in my sunporch to these darker, more fall-like colors. In the den, I changed my blue and white summer pillows for theses rust and cream Ikat pillows. Small change but big impact! Not a lot of effort for a lot of change, right? If this seems like too much to tackle all at once, start watching for sales on decorative items. Right now you can find all kinds of really inexpensive summer accents marked down to a fraction of their original cost. Buy them now and save them for next summer. You may not have the instant gratification, but you'll be excited when you get to take them out next year. Soon the fall accessories will be on sale and you'll still have plenty of time to get some use out of them before you have to put them away. Be creative, but don't go overboard. A few accents here and there will be all you need to welcome in the fall. Over the next couple of months I'll be making some more changes, but easing into it feels right to me. Posted in It's The Season, Around The Home and tagged with fall, seasonal decorating, accessories, pillows. September 11, 2012 by Lynn Adams.